We've been racing through books around here left and right lately. Instead of writing up individual book reviews, I'm going to list several in the same post, staring with a sequel in a newly released series. The second installment of The Imaginary Veterinary series, The Lonely Lake Monster , was released and both Bookworm1 and myself finally both had a chance to read it. Regulars will recall that I read Book 1 in this series and deemed it safe enough to hand over to the eldest bookworm. He ended up devouring that book in a matter of days. The second book picks up right where the first one leaves off. Pearl and Ben are set to begin their apprenticeships with Dr. Woo at the Imaginary World Veterinarian Clinic. Both are excited to dive on in to their new duties, but first they must convince their parental authorities that Dr. Woo is not a crazy woman and that their working at this mysterious place is a good idea. This would be the part of the book which I least liked. Ben and Pearl are made to sign a contract promising that they will not tell anyone about what this clinic really is or what their responsibilities there are. In The Lonely Lake Monster the idea of lying to one's parents - by keeping secrets and making up explanations about what they are really doing - is emphasized and I did NOT appreciate that aspect of the book one iota. You should be aware of that subject/theme in the book if you decide to hand it over to your kids. I am still ok with the idea of Bookworm1 reading it because it is fun to read a story which involves mythological creatures. It asks the great "what if?" question of what it would be like if you were to have to clip the toenails of a Sasquatch or hitch a ride in the mouth of a lake monster. 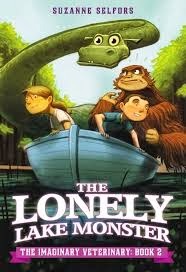 Again, I think this series is creative and fun enough for young readers. It's not spell-binding for adults and it certainly is not classics material (by a long shot!) but it is amusing and, provided the issue of hiding secrets from one's parents is discussed, I'm ok with him finishing up this series. Many thanks, once again, to LB-Kids sending a copy of this book in order to facilitate this review. I have received no additional compensation for this post and all opinions are 100% my own. A Great and Complicated Adventure lives up to its name in my book! It arrived on our doorstep and I assumed it was for review. I have no idea where it came from and absolutely nothing shows up in my e-mail inbox about it. I assumed I had accepted it for review at some point and then had forgotten about it. It wasn't until after the bookworms and I had read this together that I realized it is a book with mysterious origins. 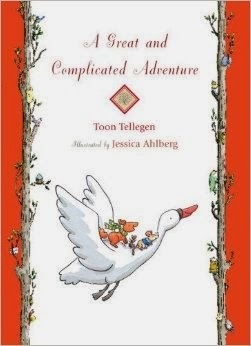 A Great and Complicated Adventure was written by a Dutch author by the name of Toon Tellegen. This book is one in a series, all of which are a collection of short stories. Tellegan's books have been translated into many different languages and are purported as having been "enjoyed by children all over the world." My children can now be included in that description. The stories in A Great and Complicated Adventure are short and sweet (each being 2-3 pages long and featuring a great many illustrations alongside). Each story features an animal or two (or three), most often a squirrel. The stories are somewhat nonsensical in an Arnold Lobel sort of way, only they make much less sense (in my opinion) than Lobel's stories do. But, for the sake of a reference point, I think Tellegen and Lobel have similar styles. The illustrations by Jessica Ahlberg compliment the stories well and, I would have to say, are my favorite aspect of this book. As an adult reader, I had a hard time appreciating this one. My kids enjoyed it and asked me to read several stories in a single sitting. But I did not find that the stories offered a whole lot of depth. They failed to kick the imagination into gear. That to say, they are not awful stories by any stretch of the imagination but nor are they brilliant. They are just there. Not a very high recommendation, I do realize, but there it is, nevertheless. Cute-ish, but not satisfying. Many thanks to whoever sent this my direction. I'm glad to have become familiar with Tullegen, no matter. SO, I'm guessing the second book just looks cute so it promises more than it delivers.